2. Alice Waters - The great Alice needs no introduction. OK, just this: Chez Panisse, farmers’ markets, locavore movement, Edible Schoolyard. As yet, they’ve only made documentary movies about her life. I used to want to do what Alice Waters did. Okay, I still kinda do. I want to open a restaurant in a big, empty house in a hip part of town and either grow my ingredients in my own backyard or source them locally. I want to print my prix fixe menu daily on a chalkboard that I sit on the sidewalk outside every day. The menu would only have a few options. If you liked the freshest food possible cooked by someone other than yourself, you'd stop in. My china and silver would be mismatched and charming. I'd pick fresh flowers to put at all of the tables. My staff would be few and trusted and talented. For those living under a rock, I'm talking about Chez Panisse, the Berkeley restaurant started by Alice Waters back in 1971. Waters is the vice-president of Slow Food International and the founder of the wonderful program, The Edible Schoolyard. The Edible Schoolyard is perhaps my favorite thing that she does. Giving kids access to organic gardens and kitchen classrooms instills a lifetime of knowledge and respect for food. While I know from experience that it is not always possible to buy organic or local due to high prices, I think learning and exploring and getting your hands dirty is an experience every child should be exposed to. 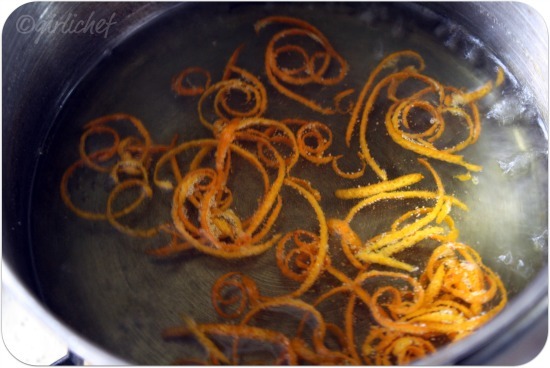 Remove most of the zest from one of the oranges with a citrus zester (the type with the tiny holes) in long, thin strips. Put ½ c. of sugar and the water into a small saucepan and bring to a boil. Add the strips of zest, reduce heat, and simmer for 20-30 minutes, or until peel is tender and syrup and reduced and thickened a bit. Let cool. Rinse strawberries and gently pat dry. Hull and slice them into ~¼" thick slices, then place in a bowl. Using a knife, cut off the ends of the oranges and remove the skins (taking only the slightest outer layer of flesh with it). Slide a sharp knife along each membrane to remove the segments of orange (the supremes), dropping each segment into the bowl with the strawberries. Squeeze the remaining juice from the orange "carcass" into the bowl over the fruit. Sprinkle with remaining sugar and mix gently. 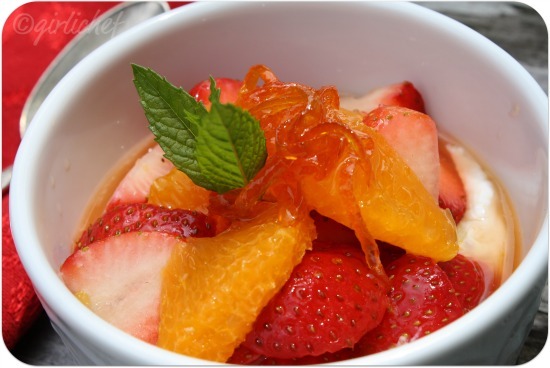 Serve compote with some of the candied orange peel on top and then drizzle with a bit of the thickened syrup. 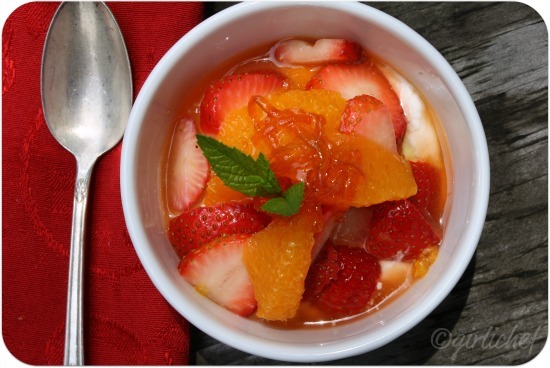 My absolute favorite way to eat this is to spoon it over some plain Greek yogurt...the combination of the thick, tangy yogurt against the sweet fruit and syrup is luxurious! *Normally, this will be a weekly post (on Friday's), but since I missed the first two weeks of cooking along with the crew, I am playing catch-up. Regular weekly posts will start with #3, tomorrow. ciao ! What a fantastic list ! the fun part for me is that i'm not familiar with most of them ! i'd love to join you but i have one more crazy week ! A fun idea. I love Alice Waters and this simple recipe looks fantastic. Super delicious and fantastic compote.. I love how you are honoring these great women! The compote looks scrumptious! A perfect choice Heather. I look forward to travelling with you! I am hosting a summer salad blog hop on my blog and would love it if you could stop by and link up a summer salad recipe you might have in your index! Thanks Heather! If I ever open a restaurant, I want it to be super similar to Chez Panisse. I love Alice Waters's ideals! And I love her food. 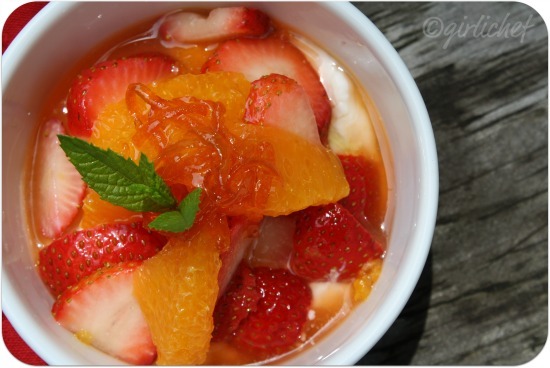 This compote looks fantastic! what a fun idea. Lovely compote, pass the spoon. can i come to your restaurant, it sounds just lovely, as does this compote! I just love this series that you are presenting, I just read every word. I just love this post and the recipe. Thank you so much for sharing with Full Plate Thursday and I look forward to seeing you again real soon. This looks like it is bursting with flavor!